We are frequently asked about the archaeological significance of our finds which were not found in their original context, and other questions about our unique methodology. For this we have created a new page (see website menu above) in which we clarify and explain our unique methods for retrieving and studying the Sifting Project finds. When we began transferring the mounds of Temple Mount material from the Kidron Valley dump to the Tzurim Valley National Park, we divided the dump into various areas. We suspected that the order of the removal of the earth from the Temple Mount and the location of its dumping may correlate somehow to the way it was excavated. We also separated the marginal areas of the material from the internal areas that had not been disturbed by the other illicit dumps in the Kidron Valley. The Temple Mount material was eventually divided to 11 areas that were removed separately. Early in the Sifting Project, we already noticed that there were differences in the frequencies of certain types of finds from different areas. Moreover, similar finds, and sometimes fragments of the same object, were discovered within short periods of time. This suggested that these similar objects were originally next to each other. But the full significance and value of dividing the material at the dump into different areas was discovered only last summer, during the processing of quantitative data for the Third Preliminary Report which we recently published. We found that artifacts which we assume to be from the same context were also distributed in a similar manner. Another example is that we found that artifacts which can be identified with the Horses of the Crusader era Templar Knights were distributed in a similar way among the dump areas. We concluded from this that we can define a statistical distribution “fingerprint” for each artifact type. Artifacts that have a similar “fingerprint” may have originated from the same context. The statistical technique for finding such relationships and verifying their statistical significance is called Cluster Analysis.We will not go into a detailed explanation of this technique, but we can foresee that at the completion of the classification and sorting process of all the different types of finds that we have, we will be able to apply this technique on a unified data table of all the finds. The results of this analysis will show clusters of finds having similar distributions. These clusters may also represent a similar context of the finds within them. Currently, we are still investigating the application and implication of this method. Only after finishing the classification and sorting process, will we be able to create a full data table that will be adequate for such an analysis, and then we will be capable of fully estimating the value of this method. If we are able to achieve valuable information from this type of analysis, it will be a substantial innovation in archaeological method and theory research which could also be applied by other archaeologists who focus their research on excavations of fillings or site surveys. It can be seen in the table that the distributions of the carrots and the onions within each bowl are similar, but differ from the distributions of the cucumber and the tomatoes in the corresponding bowl and vice versa. This is the value of “cluster analysis.” By observing the percentages of various types of finds within each area, we may be able to determine which types of finds originated from the same context. One of the major tasks in our project is to develop ways of overcoming the absence of an archaeological context for the artifacts. A common method to address this obstacle is to date and study artifacts using typology. 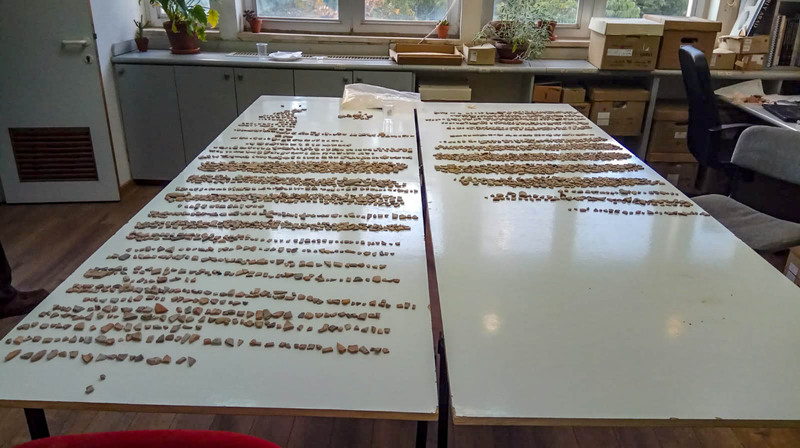 That is, using the knowledge of frequent finds from other archaeological sites – parallel finds that were recovered with a clear context – to assume that our finds should also be related to such a context. Typology means that certain traits (technological and stylistic) tend to appear together in a repetitive pattern, which, because of standardization rules, creates types. Types tend to appear in many parallel sites in a certain time span. In most archaeological excavations, the majority of the artifacts are not found in a primary context. Often, most of the features excavated are not “sealed” loci or layers of destruction in which the artifacts were preserved in their primary form of deposition. Rather, in most cases, the excavated features are late fills. These late fills can contain out-of-context artifacts from various periods up to the time of the fill, or stratified accumulations of debris that came from either a natural wash or from human-earth maneuvers. Nevertheless, archaeologists still carefully excavate such features. These features can still include artifacts that can be identified and dated; thus shedding light on the features, the site, the culture, and the period themselves. Archaeological researchers also make extensive use of archaeological surveys, which are based on artifacts collected from the topsoil of archaeological sites. The topsoil usually contains a good sample of artifacts from all periods that the site was occupied. The reason topsoil can be so highly indicative is likely due to repeated plowing that occurred at the sites during the various time periods. By sampling these artifacts, we can get a general idea about the times the site was occupied and the type of material culture that was in use during those periods. In many ways, the artifacts recovered from the earth of the temple mount could be studied similarly to those from an archaeological survey. Temple Mount has never really been excavated before, and we do not currently have records of internal prevalent archaeological artifacts. As a result, our efforts with the Temple Mount debris could truly start to provide a substantial amount of original information from these artifacts. The issue here, however, is that in order to discover meaningful information from the distribution of the various types of finds it is not enough just to quantify them, but rather to compare them to other finds that were recovered from similar samples. For example, in the study of the fauna remains, we have found several foxes. In order to find out if the amount discovered is actually significant, we first need to know what would be considered an average amount of fox remains in the debris of other locations in Jerusalem. Since we are recovering the artifacts using a unique methodology (wet sifting), the distribution of the various types identified cannot be compared to the distribution of artifacts that were published from other excavations. Instead, the proper way to achieve this task is to create control groups by sampling debris from various areas in Jerusalem. This debris should be as similar as possible to the debris from the Temple Mount by the site formation processes it went through. The earth from these samples should then be sifted and sorted in the exact same ways the earth from the Temple Mount is treated. This methodology of using statistical control groups is common in most scientific researches, but in archaeology, unfortunately, it is rarely used. For this reason, we have begun sampling debris from various sites in Jerusalem. Our first step was to sample debris from excavations that were currently being conducted. 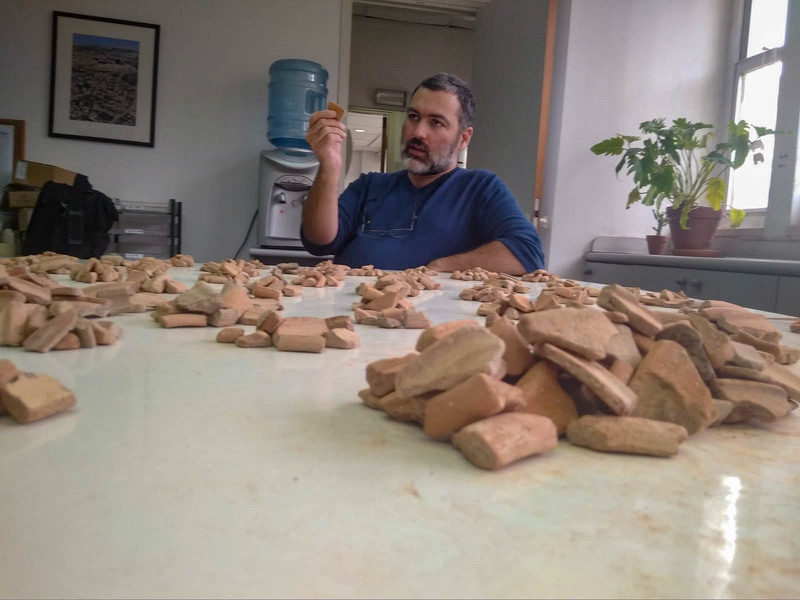 We have already sampled debris from Eilat Mazar’s excavation in the City of David, Yechiel Selinger’s excavation in the slopes of the western hill, and from Shimon Gibson’s and James Tabor’s excavation near Zion’s gate, just outside the Ottoman Old City walls. The remains from these sites contain a mixture of artifacts from various periods. Most notably in fact, is the latter example. It is a medieval fill that contains artifacts of a period span from the Iron Age II (First Temple period) until the Fatimid era (Early Arab period). This is a very similar fill to the one that blocked the Solomon’s Stables northern archways, and is now being sifted by us. In the near future, we also plan to transfer two more samples to the sifting site. The first is another fill from the Early Arab period, from Doron Ben-Ami excavation at the Givati parking lot, near the City of David. The second sample will be taken from the Pa’amon Garden, a location containing archaeological debris dumped in the 1970’s during extensive excavations outside the Old City Western Wall, conducted by Magen Broshi. We may decide in the future to sample even more locations, if necessary to increase the sampling level. The next step will be sifting and sorting these samples and then doing comparative statistical tests on the Temple Mount material. Although much work lies ahead of us, we believe that this is the only way to attain meaningful innovative information from the prevalent finds of the Temple Mount debris.